Glades, with exposed bedrock and shallow soils, appear as essentially treeless openings within woodland communities. Glades are hot, dry, sunny, thin-soiled, rocky areas that appear as openings in an otherwise wooded area, usually in upland areas. They are often described as desert-like, but they share more plant species with our tallgrass prairies. Rock pink, or fame flower, blooms on a chert glade at Wildcat Glades in southwestern Missouri. Glades are open, rocky barren areas usually located amid upland woodlands. Their upland location, thin soils, exposed rocks, few trees, and south- or west-facing aspect makes them hot and dry. Plants and animals adapted to our glades will remind you of the desert, or of prairies. Many other plants and animals benefit from glades because of the transition zone between the open, sunny glades and adjoining wooded areas. In Missouri’s Ozarks, glades used to be more common than they are now. When fires never occur, glades eventually become dominated by eastern red cedar and other trees, which shade out the sun-loving flora, changing the habitat and plant community drastically. Eventually, the collared lizards, roadrunners, and other rare herps, birds, and other animals disappear, too. Historically, lightning strikes, Native Americans, and American settlers occasionally started fires, which kept the cedars from taking over. But after decades of fire suppression, conservationists have learned that glades disappear without occasional fire. This is similar to the situation with prairies, which also eventually turn into forests if nothing happens to keep woody plants from taking over. So good land management of these habitat types includes carefully informed use of controlled burning. Why are glades where they are? What makes a glade? As with all habitat types, a combination of factors are involved. Glades are typically in rocky, shallow-soiled upland habitats, which in Missouri generally means the Ozarks. The bedrock is usually solid and hard and doesn’t weather very rapidly. Think of high ridges, knobs, or domes. Glades often face west or south, which means they get lots of sunlight, making them very hot in summer (and pleasantly warm on sunny winter days). Erosion keeps the soils from deepening. The lack of deep soil and full exposure to sunlight makes them dry. Periodic, controlled burning of glades replicates the occasional fires set historically by humans and lightning. Few trees survive on hot, dry, rocky glades, which historically experienced relatively frequent fires. Many glades are bordered by ancient stands of fire-resistant post oaks (many more than 300 years old), attesting to the historic grassy openness of the woodlands (not closed forests) surrounding the glades. When the grasses burned and these large trees survived, smaller trees were killed and could not get established. In addition to fire, other natural disturbances that kept glades from becoming wooded were drought, frost upheaval, and native grazers. And although they are hot and dry during the growing season, in winter, spring, and fall the soils can at times become saturated by rain or snowmelt. Starting in the early 1800s and lasting until quite recently, a combination of overgrazing, complete fire suppression, and other factors has allowed woody plants, especially eastern red cedar, to encroach on glades. It reached the point where many people came to associate cedar trees with glades. Even professional botanists viewed them as “cedar glades.” But apparently, before American settlers arrived, cedars were not common in most places in Missouri, including glades. Thus glade restoration usually begins with cutting down cedar trees. The hot, dry conditions, plus the soil chemistry and other factors, limit the types of plants that can survive in glades, and the combination of life-forms contributes to making a glade a glade. Some of these organisms are commonly associated with the desert Southwest or the southern Great Plains; in many cases, Missouri represents the northeastern limit of their ranges. Other plants and animals, more common in balmier southeastern states, find their northwestern limits in Missouri’s glades. Plants usually associated with prairies and even with deserts grow in hot, dry, rocky glade habitats. First among glade plants, drought-tolerant lichens and mosses cling to the rocks. Several glade plants are especially adapted to the desertlike conditions — prickly pear cactus, glade and yellow coneflowers, prairie dock, compass plant, wild petunia, and Missouri evening primrose, bladderpod, and geocarpon all have special mechanisms for surviving drought. Many warm-season grasses and other plants we commonly associate with prairies are often found on glades: little bluestem, sideoats grama, switchgrass, and prairie dropseed, for example. Many fascinating animals live on glades, including several herps (amphibians and reptiles) such as the eastern narrow-mouthed toad, southern coal skink, six-lined and prairie racerunners, Great Plains ratsnake, flat-headed snake, eastern (red) milksnake, eastern collared lizard, eastern coachwhip, and several more. Many of these are secretive, keeping cool under rocks during the heat of day. Birds associated with glades include roadrunner, yellow-breasted chat, painted bunting, Bachman’s sparrow, field sparrow, brown thrasher, and prairie warbler. Before they moved into cities, where they nest on the hot, dry tops of buildings, common nighthawks once built their nests on the warm rocks of glades. 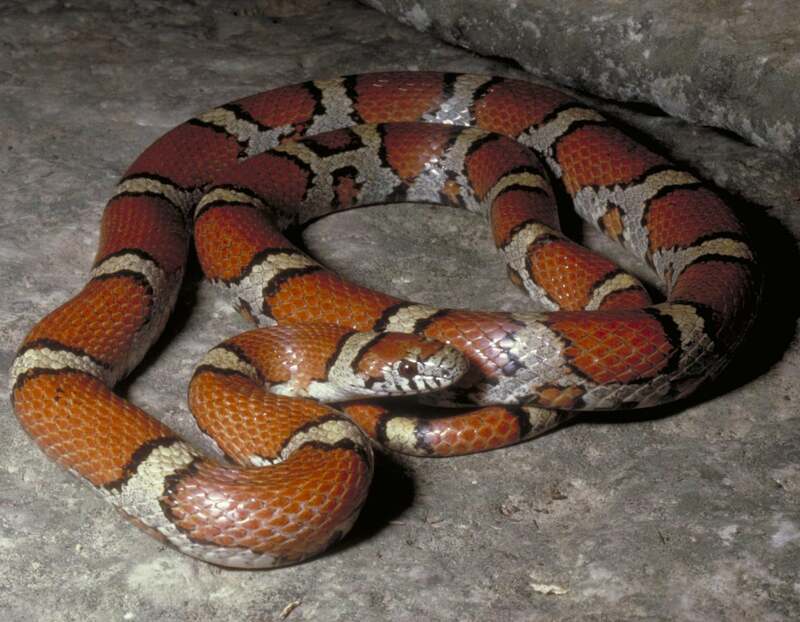 The red milksnake is secretive and seldom seen in the open. It is found on rocky, south-facing hillsides, especially on glades. Texas and desert mice are especially noted for living in glades, but many other mammals thrive when glades occur in their woodland habitats, providing warm sunny spots on cold days, and a patch of grasses, forbs, and relatively abundant insects to eat. A host of insects, spiders, and other invertebrates occur specially on glades. Like the herps, many stay hidden in crevices or under rocks: the striped bark scorpion, Missouri tarantula, black widow, and harvestmen (daddy longlegs) are notable. The lichen grasshopper is restricted to glades, but many other grasshoppers (some of them rare or threatened), beetles, flies, ants, and bees are strongly associated with glades. Several butterflies, skippers, and moths are common on glades, and the Ozark swallowtail, Papilio joanae, is primarily restricted to Ozark glades. Missouri’s largest tiger beetle, Cicindela vulturina, lives only in dolomite glades in the White River Hills. Glade communities are distinguished by their underlying rock type, which strongly influences the soil chemistry. Igneous, chert, and sandstone glades, for example, tend to have acidic soils, while dolomite and limestone glades are calcified, with alkaline or neutral soils. Soil type is a big influence on which kinds of plants grow there. The different bedrock types appear as outcrops in different regions of the Ozarks, so the five different glade types occur in different regions, too. To see examples of all Missouri’s glade types, you’ll have to travel around the state! Limestone glades support many types of wildflowers, including Missouri bladderpod. Limestone glades occur mainly in southwestern Missouri, along the west and north borders of the Ozark Highlands. They are much less common than dolomite glades, which are somewhat similar. Most limestone glades are relatively small in acreage and are typically located above rivers and streams. Calcium leaches out of limestone and dolomite, so glades on those bedrocks have alkaline or neutral soils. With similar soils, limestone and dolomite glades have many plants in common, and many of these are also associated with prairies. Little bluestem, sideoats grama, Mead’s sedge, wild onion, prairie dock, and Missouri coneflower are common to both. Limestone glades are especially noted for prairie tea, orange puccoon, narrow-leaved milkweed, eastern prickly pear, dwarf spiderwort, Missouri primrose, false aloe, and more. Spurgeon Hollow NA, in Shannon County, features dolomite glades. Dolomite glades beautify much of the Ozarks. Widespread and abundant, they are found nearly throughout the Ozarks, but they are concentrated in Barry, Stone, Taney, and Ozarks counties in the southwest, and Jefferson County in the east. They usually dot south- and west-facing slopes in hilly landscapes, and they are usually separated from each other by expanses of woodland and forest. Some dolomite glades are up to several hundred acres in size. As dolomite erodes, its horizontal layers create a stairstep or blocky pattern. Their many nooks and crannies offer hiding places for small animals to hide or for plants to root. The calcium that leaches out of dolomite raises the soil’s pH, so the plants the live on dolomite glades must be able to live in these alkaline or neutral soils. Look for Missouri black-eyed Susan, yellow coneflower, Missouri evening primrose, scurfy pea, prairie turnip, and many grasses usually associated with prairies: little and big bluestem, sideoats grama, and switchgrass. Chert glades are very rare in Missouri and are found only in the extreme southwest part of the state. Chert glades are very rare in Missouri and are found only in the extreme southwest part of the state; in fact, only about 20–60 acres of this habitat remains, most of it within the city limits of Joplin. The soils are especially shallow and acidic, so the plants and animals are quite specialized. Because chert weathers so slowly, there are few crevices to serve as shelters for animals. Historically, chert glades were probably grazed by bison and elk, and the fires that kept trees from encroaching on these glades apparently reached them by spreading from nearby prairies and savannas, which are also maintained naturally by fire. As in the other acidic glades, lichens and mosses are abundant. Common plants include sedums, selenia, Venus’ looking glass, eastern prickly pear, aromatic aster, dwarf dandelion, pinweed, and Barbara’s buttons. Say’s grasshopper (Spharagemon equale), with gray-tan camouflage but bright yellow-orange legs, in Missouri is apparently found only on chert glades. Sandstone glades are usually gently sloping or flat and have acidic soils. Sandstone glades occur mostly along the edges of the Ozark dome, scattered across the northern half of the Ozark Highlands, with more dense communities on the west and north Ozark border. They are similar to igneous glades, but because sandstone weathers and erodes differently, sandstone glades have a smooth, less rugged appearance. They are usually gently sloping or flat and occur lower within the landscape than other glade types. They also tend to be smaller in terms of acreage. Often, there are shallow temporary pools following rain or snowmelt. As with other glades with acidic soils, sandstone glades have extensive areas of the bedrock covered by lichens and mosses. Sandstone glades are bordered by dry woodlands with stunted, gnarled trees and shrubs. The rare plant geocarpon, a tiny, succulent member of the pink or carnation family, occurs almost exclusively on sandstone glades in west-central Missouri. Because igneous glades are usually situated on hilltops, they can provide spectacular views of the Ozarks. Igneous glades, which typically have rhyolite and granite bedrocks, occur in southeast Missouri, especially in the St. Francis Mountains and in a few places in the Current River hills. They are usually situated on hilltops, so they provide some of the most spectacular views of the Ozarks. They vary in size from less than an acre to broad expanses of 30–40 acres. The hard, insoluble rocks are often exposed, creating a rugged terrain. Dry woodlands with stunted, gnarled trees and shrubs often occur at the edges of these glades. The irregular nature of igneous bedrock creates occasional deep pockets in which soils can develop. Igneous glades have many plants in common with the similarly acidic sandstone glades. Look for plants like blue curls, rock pink, sundrops, and more. Lichens and mosses are plentiful, but grasses typically are not the dominant plants. Most of Missouri’s glades are south of the Missouri River in the Ozark Highlands, plus some counties in the Mississippi River hills. There are currently about 400,000 acres of glades in our state, out of the estimated half a million acres that existed at the time of European settlement. The largest threats to glade systems today include erosion of already shallow glade soils, invasion by both native and exotic species, human development, and exploitation of glade plants and animals. Acquisition of glades as public lands is one way to ensure restoration and management, but because of the separated, widely distributed, yet interconnected nature of glades, cooperation by private landowners is critical for the health of these systems. MDC and partner organizations have cost-share and incentive programs available for private landowners aimed at improving glade communities on private property. Overgrazing, fire suppression, invasion by woody species, and habitat fragmentation are a four-pronged threat for glades, often occurring together and exacerbating each other. Historic and continued overgrazing of glades leads to erosion of their delicate soils and causes native plants to disappear, reducing diversity. When fire doesn’t occasionally occur, woody species, especially eastern red cedar and winged sumac, increase. Although those are native species, they behave invasively in glades damaged by overgrazing and in the absence of fire. When woody species like red cedar take hold, they shade out native grasses and wildflowers, shrinking and fragmenting (dividing) the remaining open areas, reducing diversity of surviving plant populations. Glade conservation therefore involves protecting remnant habitats, restoration of additional sites, and maintaining those that are in good shape. This can occur on both public and privately held lands. Connecting glades ecologically by restoring true open woodland (not closed-canopy forest) habitat between them. In addition to eastern red cedar and winged sumac — native woody plants that commonly invade glades and turn them into wooded areas — there are non-native plants that can invade glade communities and aggressively outcompete the native grasses and wildflowers. Some of these exotic invasive plants that tend to form dense monocultures on glade habitats are sericea lespedeza, spotted knapweed, tall fescue and meadow fescue, yellow sweet clover, teasels, and crown vetch. Many of these are extremely common along roadsides. Domestic livestock and wild mammals can carry weed seeds into degraded and weakened natural communities. Mechanical removal and herbicide treatment of non-native invasive species. Ridgetops and their open, scenic views are attractive places to build homes and other buildings. Needless to say, putting a house or a business on top of a glade does serious harm to glade habitat. A related threat to glades is quarrying, as people harvest the bedrock beneath them. Glades also suffer when people dig plants from glades or collect animals from them. Unauthorized horseback riding, mountain biking, and off-road vehicles churn the shallow soils, exposing rootstocks of native plants, accelerating erosion, and destroying plant communities. Given the shallow soils that are prone to erosion, even hikers can disrupt glade habitats. If you are hiking in a glade, stay on an established trail and try not to trample the plants or dislodge the soil. Combating the problems of human development, quarrying, plant and animal collecting, and trampling require public education, so that people not only understand how glade systems work but also appreciate their unique characteristics, including their plant and animal life. Then, people should take care to limit their own impacts on these sensitive communities, and also work to keep others from harming them. Brilliantly detailed map containing a natural glades data layer for Missouri (created by terrestrial communities expert Paul W. Nelson) overlaid with a Protected Areas data layer (provided by the Conservation Biology Institute).